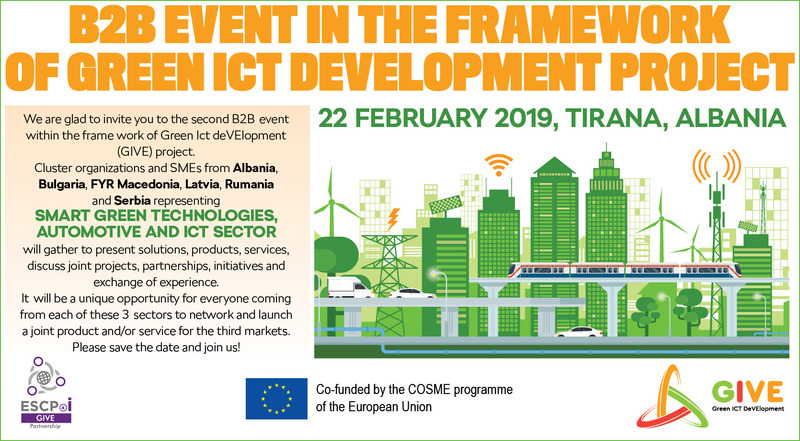 The Albanian capital with host the second B2B event within the framework of Green ICT deVElopment (GIVE) project in February. Clusters and SMEs from the field of smart green technologies, automotive and ICT sector will gather to present solutions, products, services, discuss joint projects, partnerships, initiatives, and exchange of experience. Green ICT deVElopment (GIVE) is a European Strategic Cluster Partnership in the fields of smart green technologies, ICT and Automotive. The general objective of the partnership is to build up strong collaboration and to support cluster development as a tool to SMEs internationalization and market access. GIVE ESCP consist of eight partners from six European countries and five ICT Clusters from Albania, Bulgaria, Macedonia, Serbia, and Latvia. It will be a unique opportunity for everyone coming from each of these 3 sectors to network and launch a joint product and/or service for the third markets. The B2B event will take place in Tirana, Albania on 22 February 2019. If you want to attend the event click HERE.